Business Calendar Free by Appgenix Software. 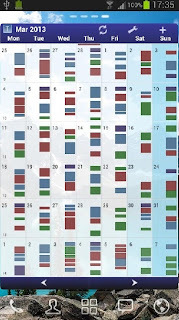 A color full, very professional looking calendar application that has every feature a busy person might need. 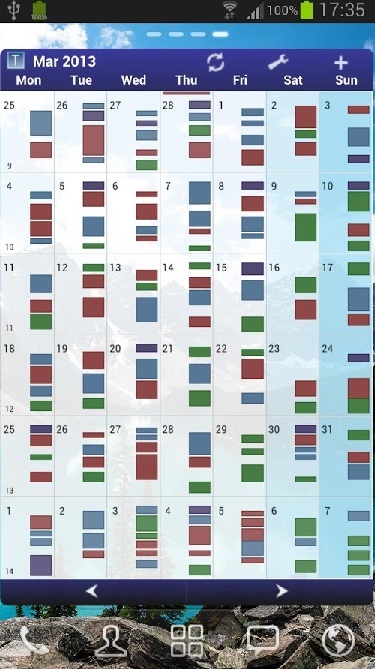 Starting with the ability to sync with Google Calendar, color coded display, configurable days, weeks and months display, recurring events and a very useful search option. We found this app very useful, configurable and generally our testers were impressed with its quality and professional looking interface. The Google Calendar notifications of events are not that bad, though the pro version of the Business Calendar adds notifications of its own. There are a ton of options such as the ability to send emails to participants of events and much more. Rare problems were found when updating (one of the testers lost her events and was very pissed) and it seems it does drain the battery more than people would have liked. In addition, several of our testers did not have Google Calendar notifications turn on and did not receive notifications for their events. The adds appear in an unobtrusive way. In conclusion, a very profession calendar app for time management with lots of options and abilities and it is highly recommended. We believe the rare bugs will be solved in upcoming updates. Score: We gave it 4.5 out of 5 because of the battery drain problem and the rare buy annoying deletion of events. Good Points: Very feature rich and colorful, this calendar app has almost everything one could wish for. Widgets for the home screen, colors, and slick interface make this a very professional looking app. Searching is another very useful feature. Experience: There were a few problems in installing and uninstalling, mostly the bugs were quickly solved. Our testers loved the many features of the Business Calendar app, especially the email option. Longevity: Most testers stayed with this app for a good while, but some preferred the Jotre Calendar which is simpler but with less bugs, at least for now.